Book of Ra Deluxe is a wildly popular online video slot that made a successful jump from bricks and mortar casinos to your mobile device and desktop. Developed by Novomatic, Book of Ra is presented on 5 reels, three rows and features only 10 pay lines. It’s a relatively simplistic game that operates smoothly and provides an addictive gaming experience. The bonus features presented in the game include wild symbols, scatter symbols, a free spins feature, a gamble feature and the highest jackpot bonus you can win is 16,000 coins. The background takes place in ancient Egypt where the sun is busy setting behind the pyramids showcased above the reels. The reels are framed by two columns that depict hieroglyphics carved into each of them. There is a total of four main symbols including the Archaeologist and three Egyptian artefacts such as the sarcophagus, a bright blue scarab and a golden statue. The lower valued symbols include your standard hieroglyphic style 10, J, Q, K and A, each with their own unique colour coating. Before embarking on your adventure to discover the hidden treasures in Egypt, you will first need to set your desired betting options. The minimum bet per line starts at £0.40 and can be increased to a maximum of £10.00. Therefore, the minimum bet per spin is as low as £0.40 while the maximum bet per spin is a maximum of £100.00. Most video slots feature separate wild symbols and scatter symbols. However, the golden Book of Ra icon represents both the wild and scatter symbol. Therefore, it will substitute for all standard symbols and unlock the free spin feature presented in the game. If you lucky enough to display three or more Book of Ra scatter symbols anywhere on the reels, you will be awarded with 10 free spins. In addition, you can also benefit from an expanding symbol that will be randomly chosen from one of the standard symbols on the reels before the free spin feature gets underway. Should the expanding symbol be involved in a winning combination, it will also expand to cover the entire reel to create more winning opportunities. If you would like to double your recent winnings, you can do so by clicking on the Gamble button. You will then be taken to a mini-game where you will need to correctly guess the next playing card colour between black and red. Be careful, as the wrong choice will see you lose your recent winnings. 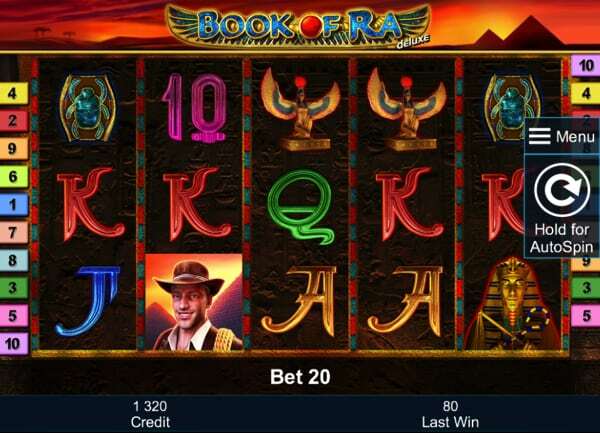 Book of Ra Deluxe is an extremely popular video slot with truly amazing sound effects and high-quality graphics. The game mechanics are basically the same as the version available in a land-based casino. Book of Ra Deluxe is presented with a medium to high volatility level, providing extremely good pay outs on a frequent basis. You can also greatly benefit from the Return to Player ratio that has been set to 94.26%. Book of Ra Deluxe is a game from Novomatic and it has been extremely popular among casino players. The game is available at casinos such as Rizk Casino.